Franca Sozzani and Italian Vogue have done it yet again. Breathtaking, exquisite and alluring are just some of the words that can be used to describe this February 2011 all-black editorial titled, The Black Allure. Lensed by Emma Summerton and styled by Edward Enninful, the spread stars some of today's top black models including Arlenis Sosa Pena, Chanel Iman, Georgie Baddiel, Jourdan Dunn, Joan Smalls, Kinee Diouf, Lais Ribeiro, Melodie Monrose, Mia Aminata Niaria, Rose Cordero, Sessilee Lopez and Australian based Ajak Deng. With a 1920s feel, the dark skinned stunners are kitted in 'tribal' inspired ensembles from the likes of Versace, Lanvin and Louis Vuitton. I love this spread for a number of reasons. 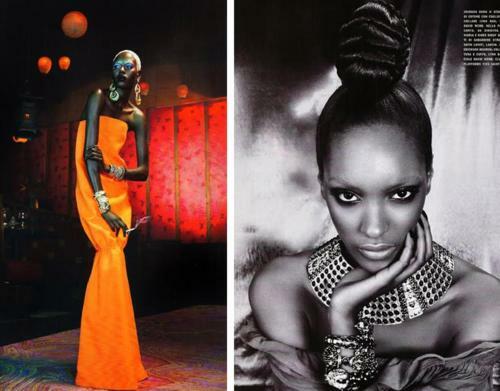 It's not just that it showcases the richness of black female beauty. Or that it illustrates the zeitgeist (or spirit of the times) in embracing all kinds of faces. 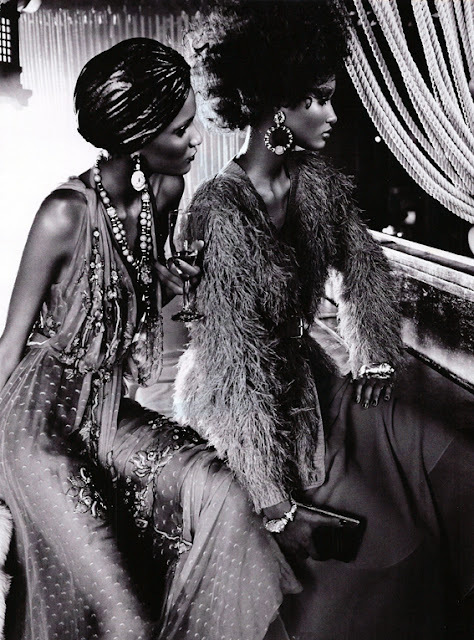 I love it because it shows that Italian Vogue's July 2008 all-black issue was not just a once-off gimmick to pacify the masses. Rather, small steps are being taken in the fashion industry to celebrate and incorporate diversity in all its excellence.